Click Here to Read the 2018 Finalist Essays! The Fr. 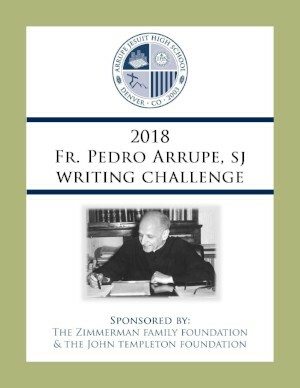 Pedro Arrupe, SJ Writing Challenge is an opportunity for students to express in writing what principle or personal ethic is a driving factor in their lives. It is meant to publicly recognize young people who reflect upon and write about their personal beliefs and values through the lens of their Jesuit Catholic education. Congratulations to all participants, finalists, and winners of the 2018 Pedro Arrupe Writing Challenge! NINTH: Awareness of Good Will/Kindness/Love. When you reflect on your life so far, think about how you have been impacted by acts of generosity, compassion, care, service and love. At the time, you may not have recognized these acts as God’s good will/kindness/love in your life. Describe an event or occasion when you’ve experienced good will/kindness/love in your life. Based on your first two years at Arrupe Jesuit, how would you define what it means to be a man/woman for others? Describe how you have personally grown into this definition since coming to Arrupe Jesuit. While a student at Arrupe Jesuit, there have been moments when you have faced difficult decisions. Describe a situation or event in which you have made a choice that best reflects you as a man or woman for others. If you did not make this kind of choice, what might you have done differently? Look back over your time at Arrupe Jesuit. You’ve had opportunities to be a man or woman for others; additionally, you’ve been impacted by men and women for others both within and outside our school community. Now, envision how you will carry forward what you’ve learned from others and about yourself. How will what you’ve learned about being a man or woman for others impact how you live your life after Arrupe Jesuit?